Happy new year all! And boy am I glad to be back. Not that I’ve actually been anywhere. Just glad to be back in my sewing seat after a whole week of being struck down by a virus. All those sewing plans… all that time off… I really didn’t account for being totally useless for all that time. I have to say, my mojo is still not motoring as normal but I’m getting there. And this was the perfect little project to ease me back in gently. 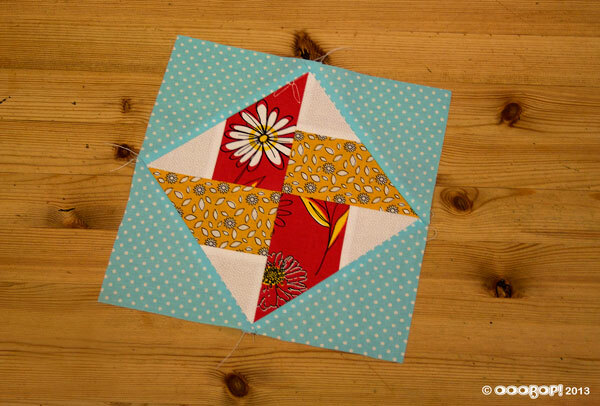 This quilt block is called the Whirlwind Square, a variation of the whirlwind block I did here. It is block number 22 from issue 24 ‘Art of Quilting’. In a nutshell: The small white triangles are paired with the tapered rectangles to make 4 triangles. All four of those triangles are seamed to make the central pinwheel (the final seam being pressed open). Then the blue polka dot triangles are sewn to each edge to frame the central block. No major issues in making this little fellow up. A simple operation but great practice for making sure those points line up. Level: Some experience needed to ensure that seams and points meet accurately. Nice neat little block, beautifully matched! Thanks Mammafairy. Way to catch up with you though! So sorry to hear that you have been ill! Hang in there gal! I’m glad you’re feeling a bit better. So many people I know have been struck with the same virus. Keeps them down for quite awhile. I’m washing my hands and hoping it doesn’t find me. Love the quilt square!